How’s your email marketing coming along and are you generating enough leads for your business? Did you know that marketing with email is about 40 times more effective than marketing with either Facebook or Twitter combined, according to a study by McKinsey & Company? The good news is, a lot of people think email marketing is dead but there is actually expected to be a rise in the number of people accessing email as a lot of developing countries are starting to come online in a big way. It’s one of the reasons I continually say that no matter how small or large your businesses is, not only should you think nationally but also internationally. I constantly get people saying to me “why should they think internationally when they have a small coffee shop, bike shop, or estate agents”. My answer is always the same: If someone is coming to visit your town or city, they’re not necessarily from your town or city and maybe just passing through or on holiday – these days, people prefer to do research online first to get a good idea of what is available before they even make the decision to travel. That’s why, even if you have a small local business, you should always think internationally with regards to your marketing. The worldwide revenue for email marketing is approximately $10 billion and is expected to grow even further at an annual growth rate of 20%. That means, as a business, you should be looking at increasing your email marketing strategy, not ignoring it or decreasing it. Email is not only great for producing leads for your business, it’s also a great way of building relationships with prospective buyers who are interested in your products or services. That way, when you’re ready to pitch your product or service, there will already be a “like, know, trust factor” and overall conversions will be a lot higher than any other marketing strategy you’re using for your business. The vast majority of businesses make the same mistake in sending traffic either to the home page of their website or a blog on their website. The reason this is a mistake is; you’re encouraging your prospects to be distracted by other content and other links on your website or blog. This is especially a massive problem if you’re paying for this traffic – in marketing terms, this is called ‘leakage’. If you think about it in the terms of using a funnel with holes in it – as you pour in the liquid, the vast majority will just slip through the holes instead of making its way through the funnel as you want it to. Though this is a very crude analogy, I think you get my point. That’s why it’s always best to have absolutely no navigation and no external links other than your terms on a landing page, so you don’t get this sort of leakage. This means having no “home” button, no “about us” link and absolutely no sidebars to cause a further distraction! The whole idea of your landing page is to entice prospects to the sign up for a newsletter, a lead magnet or a simple tutorial. There are two types of landing pages you can use: You can either opt for a landing page with bullet points and a sign-up form or you can opt for a long form sales letter type landing page. In my experience, we found using a short form landing page with bullet points to be the most effective and with the highest conversions. If you have done a really good job beforehand, then there’s no need to try and sell them in exchange for the email address. If you are going to opt for a long form sales page then I’d highly recommend that you get an expert to write some really persuasive copy to convince your prospect to sign up. No matter how long the copy is on your landing page, the first thing you need to do is reassure your visitor of the reason why you sent them to that landing page in the first place, whether that was signing up for a newsletter, an ebook or a video course, etc. Doing this one thing would increase your conversion rate of email sign-ups because it leaves no doubt exactly what they are signing up for. Since there’s so much distraction online, whenever you generate traffic back to your website, the most important thing you can do is grab the email address so you can continue to communicate with them effectively. 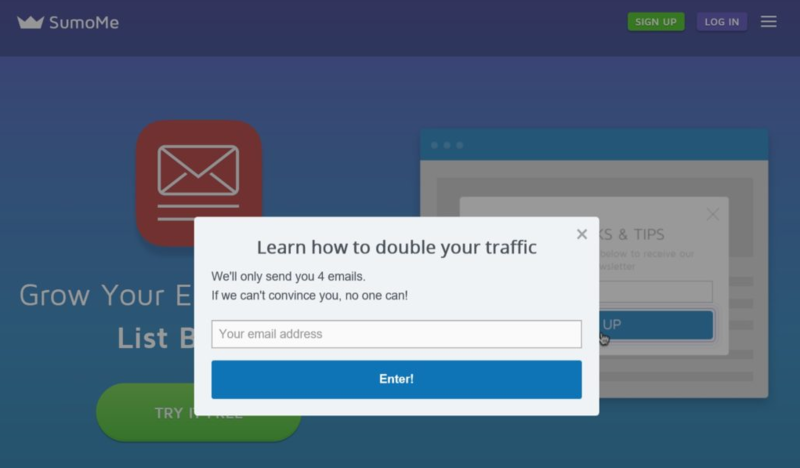 Now, we all know that one of the most annoying ways you can do is by using popups. Even though popups are extremely annoying, the conversion rates (the number of people signing up) are really high. However, there is another simple technique that gets great conversions and doesn’t annoy your reader in the process. I’m talking about adding a feature box to the top of your homepage. So, what is a feature box? 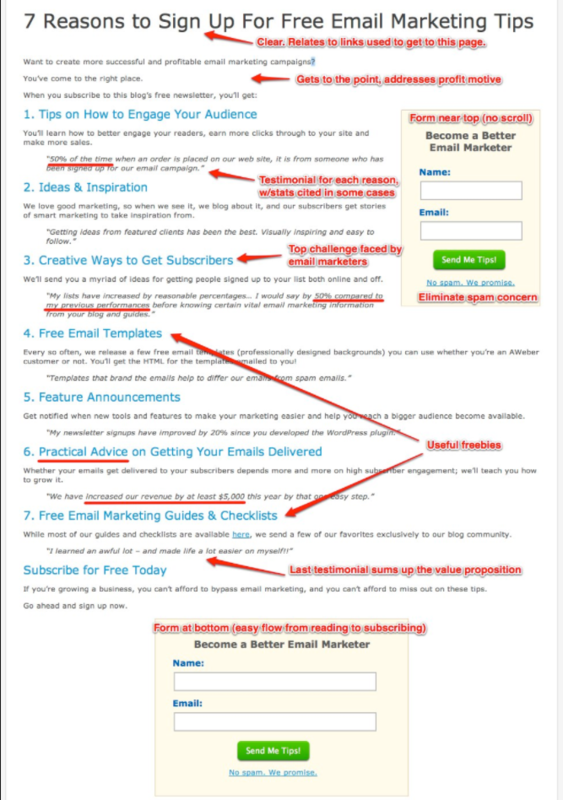 Your feature box is basically promoting your top lead magnet and is situated at the top of your homepage. Probably the best example of the use of a feature box is by Melyssa Griffin. Not only has she got a really bright, vibrant feature box on her website, she has also animated it, pointing to a short survey where she is segmenting her subscribers before they’ve even subscribed. This is email marketing at its finest. This is a pretty straightforward feature box from Nutrition Secrets. It has a main headline, sub-headline and quite a large call to action button which redirects to a sales page. A content library is a series of lead magnets that you can remote with the content marketing strategy. The idea is to have a lead magnet for every category in your niche or marketplace so that you can reference it within your content marketing. So, if you’re writing an article, you can link back or have your lead magnet situated in a prominent place for prospects to sign up. If you’re producing a YouTube video, you can have your lead magnet within the description of the video. If you’re podcasting, you can reference your lead magnet both in the podcast and also in the podcast notes. Having this content library makes it much easier to signup prospects onto your email list for each category in your niche and also is a great way of segmenting your prospects, depending on the type of information they are looking for. This is quite powerful because it means you are not sending educational and marketing messages to this prospect, packed full of information that they weren’t interested in. Everything that you sent them will be laser-targeted to their topic of interest. If you have a small website and are struggling to generate traffic, one of the best ways to do this efficiently is to use the power of content syndication services. These services host your white papers, ebooks or short reports in exchange for a fee. Even though this strategy is effective, each lead will cost you anywhere between $20 and $30, which is why you will probably need to test to see if you receive enough sign-ups for the financial cost. My advice would be to produce an outstanding lead magnet that really delivers on a few pain points of your prospects. It’s really got to do a great job in answering their questions and your advice needs to be actionable. Even though you might have built up a really solid email list for your business. You can also need to go a step further by segmenting your list. Just because most of your prospects came through a certain landing page or form, doesn’t mean they are all the same. Some of your subscribers might be ready to purchase your product or service now, whilst others will need some further interaction with you or your brand until you have built up enough trust. The best way to do this is to segment your email list, so what you are really doing is dividing your list into specific subgroups within your email service provider. You can either offer an additional lead magnet and get your prospects to sign up for this which is slightly different from the list they signed up for originally. You can tag your prospects which is easily done in software like ConvertKit or Aweber (email marketing providers) depending on what actions they take such as clicking on the link or subscribing to a different form. The benefits of segmenting in this way are really drilling down on your subscribers to find out exactly what they are after with no grey areas. This way when you send out your emails, you’ll know that there is a higher percentage chance that your prospects will be receptive to what you’re offering. For example, you may sell a certain number of widgets but if you further segment your list into red widgets and blue widgets, you’ll know that if you have a new promotion on red widgets that it’s best to send an email to your red widget list and not your blue widget list. I’m sorry for the crude example, but it really is that simple.